Ship of Life: from whence did thy come swine flu? from whence did thy come swine flu? From quite about 4 months now, we have been hearing about a flu which has created a chaos and furor in the world . almost every country has been infected with it , it seems. 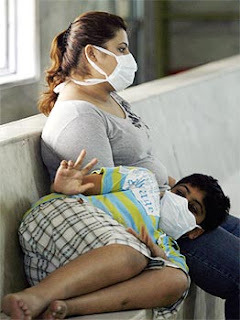 its a virus...its a flu... yesss its swine flu.. Yes! iam talking about this damn flu called the swine flu... we in India dont like pigs or swines and kick them ..... now it seems the flu in the name of the swine is set to kick us off somewhere. It is thought to be a mutation of four known strains of the influenza A virus, subtype H1N1: one endemic in (normally infecting) humans, one endemic in birds, and two endemic in pigs (swine). Experts assume the virus "most likely" emerged from pigs in Asia, and was carried to North America by infected persons. Transmission of the new strain is human-to-human, with cooked pork products safe to eat as the virus cannot be transmitted by eating foods. thank god, we can eat anywhere and anything . but dont eat pork....hehehehe... so dont keep pigs as pets even if they are white and clean like those in foreign countries. or they will give you this gift. The outbreak began in mexico with evidence that Mexico was already in the midst of an epidemic for months before the outbreak was recognized. Soon after, its government closed down most of Mexico city's public and private offices and facilities to help contain the spread. In early June, as the virus spread globally, the world health organization declared the outbreak to be a pandemic, but also noted that most illnesses were of "moderate severity." The virus has since spread to the Southern Hemisphere which entered its winter flu season, and to many less developed countries with limited healthcare systems. The virus typically spreads from coughs and sneezes or by touching contaminated surfaces and then touching the nose or mouth. Symptoms, which can last up to a week, are similar to those of seasonal flu, and may include fever, sneezes, sore throat, coughs, headache, and muscle or joint pains. The U.S. Centers for Disease Control and Prevention notes that most cases worldwide have been mild so far and most hospitalizations and deaths have been of persons that also had underlying conditions such as asthma, diabetes, obesity, heart disease, or a weakened immune system. As the virus spreads easily between people, through the air or surface contact, those who get the flu are recommended to stay home from school or work and avoid crowds to avoid spreading the infection further. and now after all these discussion on what's of swine flu, lets read something on how's to avoid it. Cover your nose and mouth with a tissue when you cough or sneeze. Throw the tissue in the trash after use . Wash your hands often with soap and water, especially after you cough or sneeze. Alcohol based hand cleaners are also good. well its both yes and no. as per the good website of rediffmail.com, they say that Oseltamivir is the recommended anti viral drug for the treatment and/or prevention of infection with the influenza A H1N1. If you get sick, antiviral drugs can make your illness milder and make you feel better faster. They may also prevent serious flu complications. For treatment, antiviral drugs work best if started soon after getting sick (within 2 days of symptoms). The government has adequate stock and the drug is made available to government hospitals at the time of outbreak and would be available to you free of cost. The drug is to be administered under supervision of clinicians. Now this damn damn virus is attacking kids more then adults... kids, who are so innocent that they dont know anything and before they know anything , they have got this flu..
so when somone stretches his or her hand to shake hands with you .. say NAMASTE , the ancient traditional method of saying hi man. hehahahaha. and for time being dont be munnabhai by hugging each and everyone you meet, your girlfreinds can wait some other time for you to hug them. after a short time when he came back, he could see that instead of 50 people, 500 people had died. he immidiately contacted the plague and asked him why did he broke his promise. the plague said that he had taken only 50 lives instead of 500 as talked before , the difference came because the remaining 450 people died in fear of the plague..
like i said before, inspite of having thousands infected cases in india and other countries, there are only very few deaths.... ratio is very small. SO DON'T PANIC. gay [not the other one , hahaha, but gay as in ,'to laugh'] keep on laughing, watch more comedy shows , be cheerful... and meditate. by meditating , nothing of this sort will come to you,leave alone see you also..
and take those masks .. it might help you someplace , somewhere , anytime. bye friends... will meet you soon. really informative ...thanks for sharing :)..
You are doing a surely great job. Your blog of which i am very much sure is going to create a huge and a sensible awareness amongst huge masses.